The High Level Bridge is composed of 33 steel towers. The towers range in complexity from having one to five different stages within each tower. I define a stage in this context as a level with an "x" of beams on each of the 4 sides, having a horizontal beam at the base and top of each, sharing with the bottom of the next stage. The X for each stage also often has a vertical beam extending from its centre, upwards for the sides (perpendicular to the river) and downwards for the fronts (parallel to the river). The exceptions to these vertical beams is that on the sides of the bottom stage, there are both upwards and downwards beams on the top stage which may follow special patterns. While the top stage generally has the fronts' "x"s without vertical beams, the sides have both upwards and downwards beams and fit two "x"s, one atop of the other. All of these beams are riveted together. 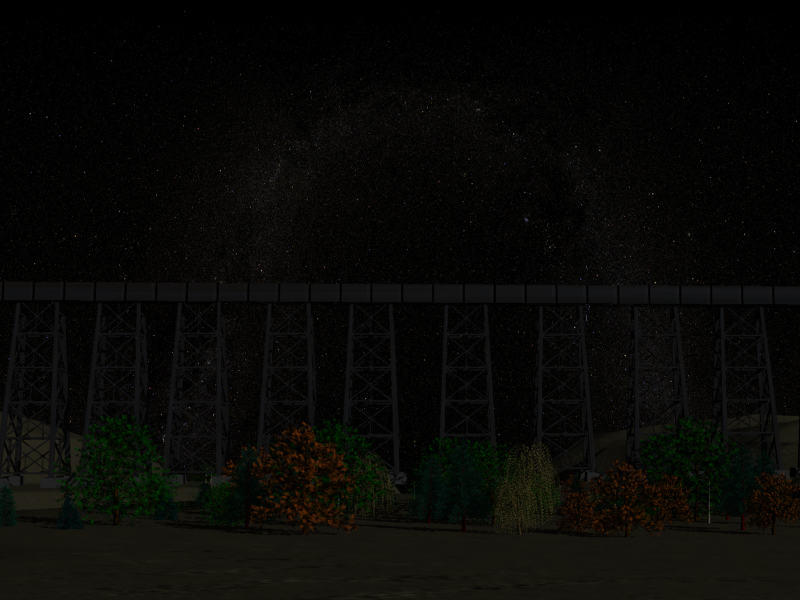 Atop the towers sit the railroad tracks, fenced off by steel paneling. The towers are composed of four kinds of beams: The "x" beams, the vertical beams that join the "x" beams, the horizontal beams and the tower struts. 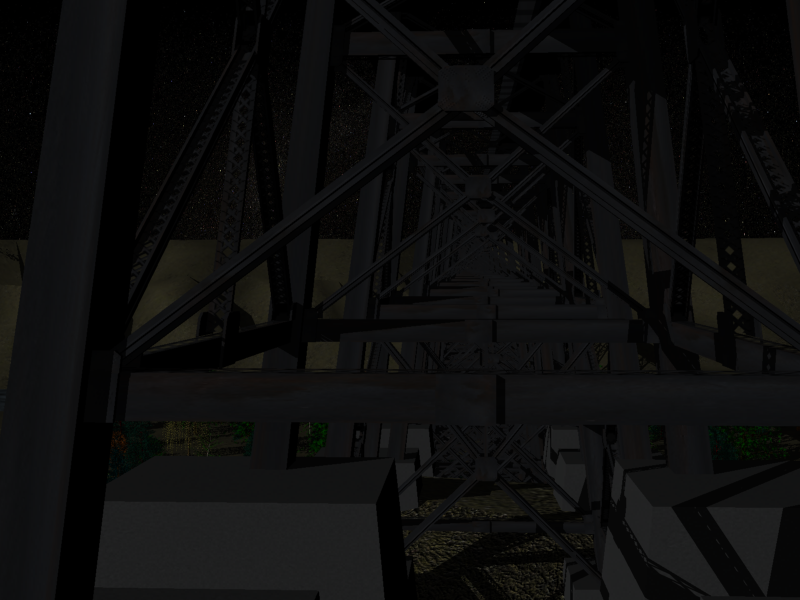 All of the beams except the tower struts have a crossed metal plating which can be seen through and the "x" beams form "I" beams, while the others form simple boxes. The The rails are little more than a bottom with two sides sitting atop it. All of the bases for the tower are concrete blocks. I modeled the three box-type beams using box primitives. Next, beginning with a box, I split two opposing sides into 3 polygons and extruded the middle two in, such as to form the "I" and I deleted the faces on the sides narrow sides of these as they will never be seen. I applied a rusty metal material, adjusted to look more black, combined with custom materials for bump maps and opacity maps, using 2-sided materials and applied these appropriately. Each was appropriately mapped with UVW maps. I formed these, through duplication, transposition and array into the "x" configuration. Next, beginning with a somewhat flat box like a plate, I chamfered the four corner edges, giving the same form as the cover plates used on both sides of the "x" and whose form is also at all four corners. The adjusted rusty metal material was applied again, with the faces having a slightly different material, setting up bump maps to represent the rivet configuration on the surface of the plates (If you look closely, you can see them). Each of these was also properly mapped with UVW maps. I arrayed the "x" configuration around the four sides of the towers and corrected for the difference between the fronts and the sides. I then arrayed the resulting stage stacked one on top of the previous, giving the five stages of the tower. I adjusted the top and bottom as needed, using the modeled elements as necessary. I applied two tapers to the tower to slant it as the towers do on the real one. These towers were then arrayed to create the row of 33. Each tower which had unique properties was adjusted accordingly. The coulees are made up of a plain with 5625 polygons, to which a displacement was applied, using an image derived from satellite imagery care of Anonymous Will Smith. The material for the coulees was a site work grass architectural material, modified to show yellowed grass, to map better across such a large area and appropriately bump mapped. After matching the alignment of the faces to the shape of the river as depicted in the satellite imagery, the river was selected and moved down. A plain was inserted which covered the surface just below where the river used to be, bisecting the terrain. This plain had a modified standing ground water material applied. A box was created, tapered and a modified architectural concrete material was applied. The boxes were then placed at the appropriate bases of the towers where they intersected with the terrain. These had to be done individually to accommodate the variation in the terrain (132 bases). The rails were created much like the I beam with a box modified in much the same way, also having a custom rusty material applied. 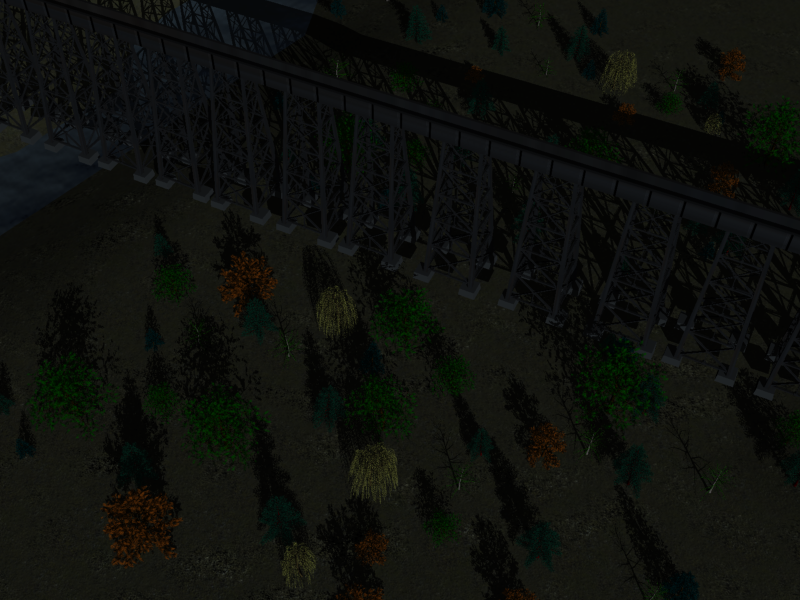 A number of AES Extended Foliage Trees were then added to the scene to add some more realism (Note that having many more than 100 AES trees will make MAX explode and will generally ruin your day - I found this out the hard way). Lastly, as part of the scene set up, I created a directional light that lit the whole area, set to generate ray traced shadows (they look better than shadow maps) and tinted the light a bluish colour (Because of the colour temperature of natural light). 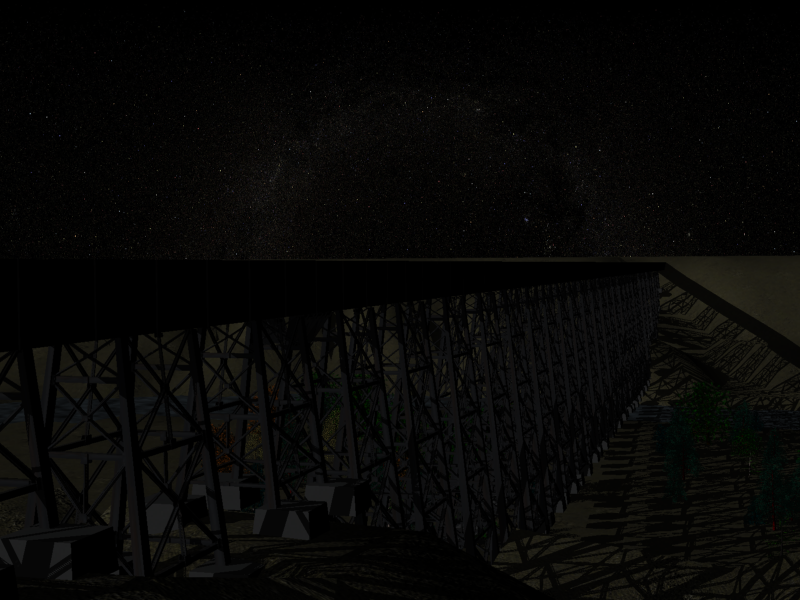 I made the light dimmer and set the environment map and reflection maps to a starry sky. I made it night time to hide mistakes - They're harder to notice in night scenes and night scenes just look nice. I chose camera angles which accented the features of my scene, while obscuring things that looked bad because they were incorrect or they had not been modeled. Lastly, I rendered with the Mentalray renderer - The others don't handle ray traced lighting as well or would take forever or would die without telling you why. All reference photographs used belong to Anonymous Will Smith. We once used them for a similar project and so he let me have them to work from. I'm not taking credit for the pictures I used as reference and I'm not entirely sure how Will got some of those pictures or the legaity of the means he used. Beggars can't be choosers and I had the images to work from. While every single material has been modified, the maps used were all modified versions of the default maps and default architectural maps in 3D Studio Max. I would assume that they are probably the property of Autodesk and I'm not saying I created them. I appropriated this imagery and changed them to fir my needs, except the star map. I didn't change the star map in any way. Unpleasantness abounds when 3DS Max decides to crash, which it does often. As you may have been able to count, 33 towers x 5 stages x 4 sides x 15 or so objects x ~8 polygons per object + 5625 polygons for the terrain and a gigillion for the AES trees is a lot of polygons. 3DS Max crashed. 3DS Max crashed a lot. It crashed while rendering. It crashed while saving. It crashed if you looked at it wrong. I often would hide or freeze geometry to lighten the load and thankfully MAX has an autobak feature so that when it crashes, even if I didn't know why, I wouldn't always lose very much progress. Max's unpleasantness aside, the most difficult thing, as expected was mapping the terrain and matching objects and their positions to the terrain. Natural forms create some bizarre geometry and worst of all, it doesn't look right without a lot of tweaking and oftentimes leads to an immense poly count. I'm still not satisfied with the water in the scene, but dynamic fluid generation systems like the one in reactor or the 3D aliens fluid simulations are complex, hard on the memory and time consuming.